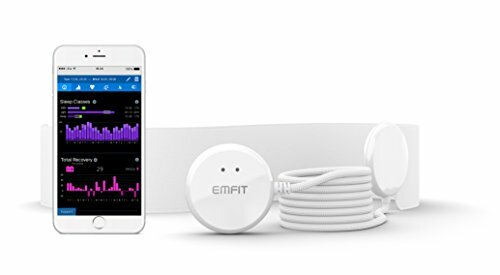 EMFIT QS is the most powerful solution for non-contact tracking of sleep and is used by professional triathletes, cyclists, runners, skiers and other endurance athletes. It is automatic, does not need a phone for its operation (connects to Wi-Fi) and is unobtrusively installed under a mattress. Easy to use web application provides comprehensive reports about physical recovery, sleep quality and structure, even autonomic nervous system balance. EMFIT QS helps to understand what has been your previous days' load and recovery and what is your readiness for a new days' exercise. You can choose optimal training intensity at every day and avoid the over-reaching condition. Recovery, stress and sleep quality analysis with whole night heart rate variability! Nothing to wear; automatic and autonomous. No phone needed for operation! 360 days long term trends really helps in tracking effects of training and lifestyle changes. WI-Fi. No app download. Responsive web app opens with all smart phones, tablets and computers. If you have any questions about this product by Emfit QS, contact us by completing and submitting the form below. If you are looking for a specif part number, please include it with your message.